The first three bits of information should be pretty evident. The fourth entry, load averages, if you recall, was explained in the “w” entry. The three values represent system load average over the last minute, last 5 minutes, and the last 15 minutes. Recall that this average is based on a per CPU rating. That is for a single cpu the value should not exceed 1.0. For two CPU’s the value should not exceed 2.0, and so on incrementing by a value of 1 per CPU. For a single CPU system a value of 1 means that for the past minute the load average has been at the capacity your system can handle, that is it ran at 100% performance and anything more would begin to tax the system. Generally you do not want your system running at 100% system load. Occasional spikes may occur, but if you notice your system exceeding .90 to 1.0 on a regular basis you may want to consider and upgrade for the tasks your system is attempting to perform or begin looking for culprits if this is not normal system load. Will continue the process and top will no longer report the process as stopped. st = percent of time stolen from the vm by the hypervisor. The last entry is helpful to those running in a virtualized environment. It stands for the amount of CPU that has been allocated by the hypervisor to the virtual machine that is not being utilized by the virtual machine. This value should be 0 outside a virtualized environment. If you are in a virtual environment and see a value greater than 0 that means that some other process (probably another virtual machine) is stealing the cpu “ticks” allocated to the current VM. 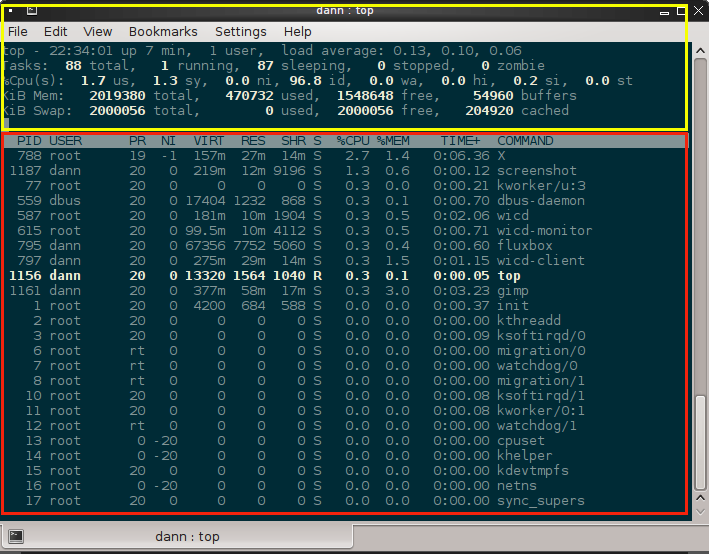 If you read the man and info pages for top you will not see an entry for id which is the percent the cpu has been idle. Where n is the number of CPU’s in the system. Thus in a dual core processor system the CPU percentage in Irix mode is 200%. In Solaris mode all percentages are treated as across all CPU’s. A value of 10% would be calculated across both CPU’s. Therefore, the CPU percentage as a whole across all CPU’s would equal 100%. The bottom two lines in the Summary window show memory information. This is the same information that was described in the entry on free. The first line will show the amount of physical memory and displays in Kilobytes (by default) the total amount of memory, total amount used, total free, and total used by buffers. Be aware of these values as they represent memory used by applications and the cache buffer used by the kernel. Do not be alarmed if the total memory reported as being used is over 2/3 your current physical memory. Remember, to get a more accurate picture you need to consult the free command an take into account the amount of memory utilized by the kernel cache. The final summary line depicts the usage of virtual memory. This shows the total amount of swap memory allocated, how much of that swap memory is used and how much is free and how much memory is being used by the kernel cache. Very roughly speaking if you total the amount of memory being used by the buffer and the cache and subtract this from the used memory total you should get the actual amount of physical memory that is being utilized applications. -n = number of iterations or refresh intervals top should process before ending. By default top never ends until q is pressed. This entry focused on the basics of the top of the top command or more accurately the summary window of the top command.